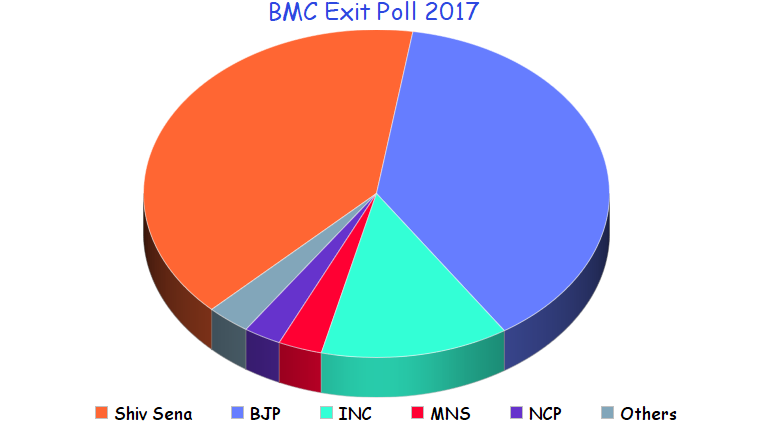 Latest BMC exit poll was announced by India Today on the evening of 21st February 2017. According to it, tough fight is expected between BJP and Shiv Sena on Mumbai ward seats. As per prediction of these recent exit polls, both the parties are expected to win 80 to 90 seats out of 227 ward seats. If these surveys are to be believed, Congress will be able to win around 30 seat. This national party is in huge loss as compared to last BMC election results 2012. Nationalist Congress Party (NCP) will be able to win only 3 to 6 wards in 2017 BMC elections. Exit polls are also predicting that Raj Thackeray led Maharashtra Navnirman Sena (MNS) will win only 3 to 7 wards in the BMC polls. No statement was made for AIMIM, Bahujan Samaj Party and Samajwadi Party. The voting has finished for BMC elections, thanks for stepping out. Total Voting Turnout is 52.17%. We are keeping an eye on exit polls, India Today My Axis Exit Poll for BMC Elections has been released. We hope that highly awaited predictions like Chanakya exit poll, will be out soon along with polls from other news channels. Due to the ban on opinion polls and exit polls in the recent times, none of the BMC Opinion poll was declared before the elections. As the voting is finished, the fate of all political parties has already been decided and trapped inside EVM. The results will be announced two days later, on 23 Feb. Till then we can check BMC exit polls to get some predictions. BMC elections were scheduled to happen on 21 February, 2017. The election result will be declared two days later, on 23 February. As many as 227 ward seats are on stake in these elections. The voting has commenced at 7 AM and it ended later in the day, at 5 PM . We hoped that maximum number of voters would cast their votes. It is their right and responsibility to use their vote and choose the most deserving candidate. These candidates are given the responsibility of development and maintenance of their ward areas. Few BMC exit polls and BMC opinion poll surveys has also be shared after completion of voting. We will also cover all the Live Updates and Result of BMC Elections. Many political parties have been looking for their chance of winning these elections. Parties have shared their list of candidates. These parties will be selecting their best candidates to be nominated for these elections. National and state parties are contesting against each other here, and BMC opinion polls 2017 can give us a rough idea about people�s verdict. The fight will be tough this time, as there is no big alliance like BJP and Shiv Sena. In previous years, BJP+Shiv Sena alliance was emerging as winners of elections, as the alliance was very promising. The state party and national party has dissolved their alliance for 2017 BMC elections, they are contesting solo as a result. Parties like Congress, NCP, MNS, AIMIM will be trying to get benefit of this separation. Such scenarios suggests that the battle of BMC elections will be interesting and somewhat unpredictable. BMC opinion polls can be handy in anticipating the popularity of these parties. Numerous fake BMC opinion polls were also shared in the past, confusing voters. These polls were initially shared online, with the prediction of Bhartiya Janata Party leading over other parties. However, real picture was revealed when people started finding the reality of these polls. The fake BMC opinion survey poll was shared under the name of Marathi news channel ABP Majha. The channel responded soon with official clarification that the polls are fake. Another poll was also shared which showed that MNS is leading in these elections. As per Maharashtra State Election commission�s orders, there is restriction on sharing opinion polls and exit polls until evening of 21 February. The restriction has taken effect from midnight of 14 February. So we can not expect any opinion poll before evening of voting date(21 Feb). One important aspect of elections are opinion polls conducted by various agencies, it gives a prediction of elections results. These surveys are conducted on a sample of people, and the results are consolidated and shared in the form of opinion polls. These results are only a efforts to see the mood of voters, and the election result could be entirely different. Mostly these opinion survey and exit polls are shared near the date of elections, as the curiosity of result is at its peak during this time. 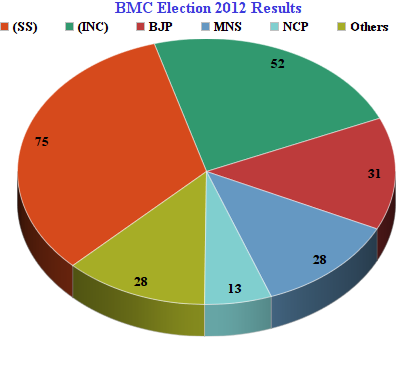 BMC elections opinion poll announced, and wait is still not over for results. To get an opinion of people, we had also created a poll. We have shared the poll above, once the voting was finished. It will provide some idea to people about the results.